This will be my last post about my garden for the year. I’m not planning on doing a fall or winter garden. Thanks for those of you who have stopped by and taken the time to read about my gardening adventures. I did this mostly for myself and to help others who were gardening virgins like me, but it was nice to know that others read the blog too. 1. Start early- You can start planting after the last frost of the spring, which in North Carolina is around mid-April. I figured I still had plenty of time after that because it didn’t start to get warm until mid-May. Due to procrastination, I didn’t really get started until the end of May. Next year, I will start a lot easier so I get more produce out of the garden. 2. Root vegetables are evil- I will stay away from root vegetables. 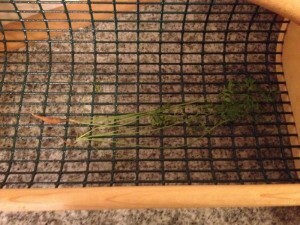 I had long carrot tops in my garden and picked them figuring the carrots would be several inches long. Wrong! The two carrots together probably added up to two inches. When I told someone about my underperforming carrots, she admitted that she had the same problems of being able to tell when root vegetables were ready. 3. Watermelons will take over the garden- I planted watermelon because I enjoy them and thought they would be great to eat throughout the summer. Unbeknownst to me, watermelons grow on very large vines that like to spread out and up, taking over everything in its path. Much like the blob. 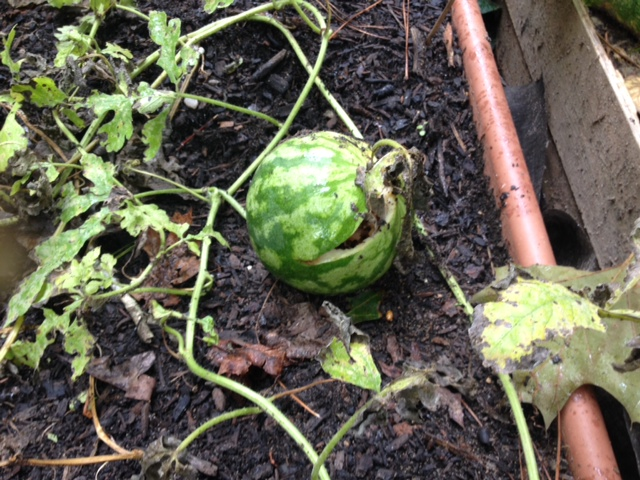 Fewer watermelon seeds next year. 4. Fertilize more- I fertilized very few times over the summer. I bought rich soil and thought that would be enough. This is probably the reason why my produce was rather anemic. I will fertilize more next summer and hopefully start a compost bin. 5. Beds need regular maintenance- I made sure to do regular weeding, watering and all the typical maintenance but once the heavy rains came over a week to one and a half week period, I dropped the ball. The mini floods caused the garden mounds to flatten out. I didn’t rebuild them because I didn’t want to disturb the growth process. Now I realize that I should have rebuilt the mounts to improve drainage. 6. Take no prisoners when it comes to garden creatures- I knew I had a problem with creatures in my garden for several weeks before I took action. The fence proved to be very effective. Lesson learned is not to wait so long next time. Take decisive action and don’t put up with creatures eating your vegetables and pooping in your garden. I’m sure there are many more lessons I’ve learned throughout the summer, but these six immediately came to mind. Thanks for reading and see you in 2015! 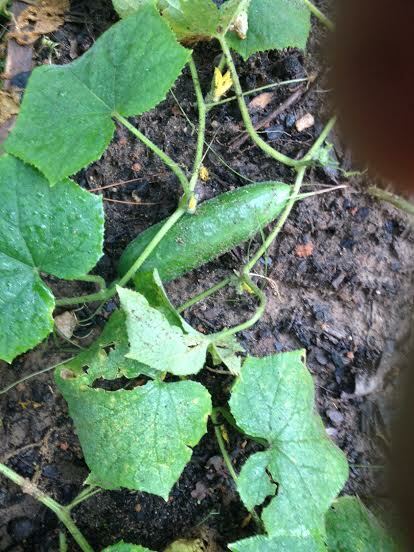 Things in the garden are still going well; the watermelon and cucumbers are getting larger and I’m seeing new sprouts each week. 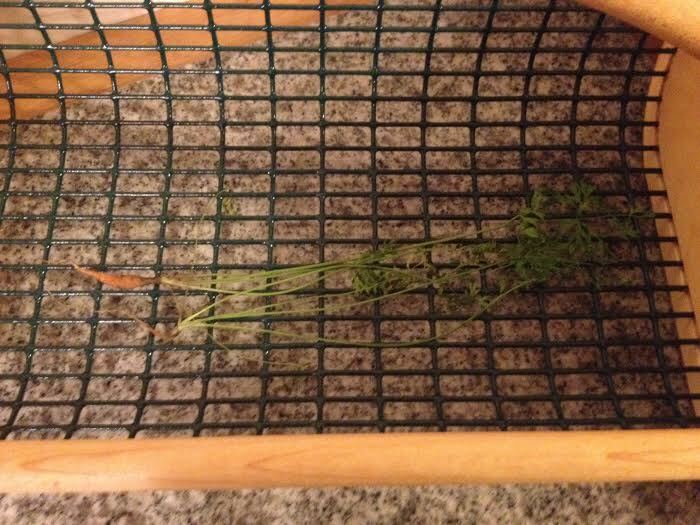 This post is focusing on another vegetable in my garden- the carrot. A couple months back I planted a row of carrot seeds. Weeks went by and I didn’t see any results. I figured they just never sprouted. In this post, I asked if the green things were weeds or vegetables. The consensus was that they were vegetables. The group was right, but I was oh so wrong. a nub and very very thin. The other wasn’t even worth taking a picture of. 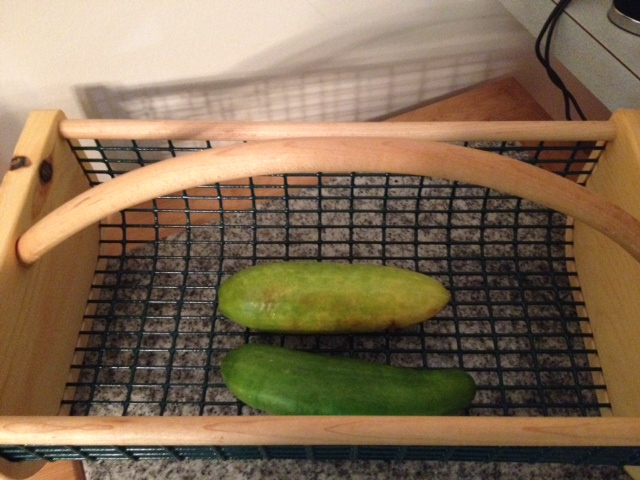 But I did want to put this very nice produce basket (a lovely gift from my mother-in-law) to use. Even though I made a judgement error on the carrots; I’m sure I will soon have enough produce to fill the basket. 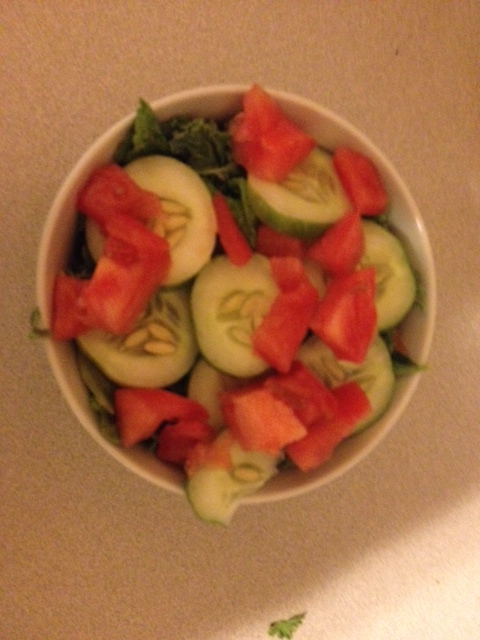 On a brighter note, check out the cucumber below. Almost ready to pick!